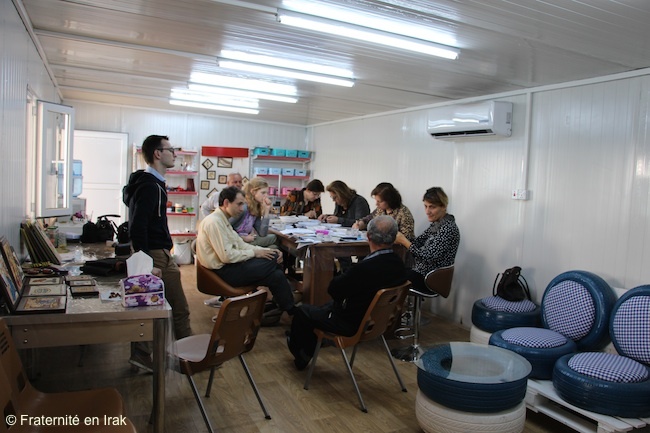 ACTION – The Brotherhood with Iraq has opened a mosaic handicraft center in Ashti camp, in Arbil. It serves a dual purpose: to provide work and a small income to women who work there, and to provide them with a space to meet and escape the promiscuity of their trailer home. 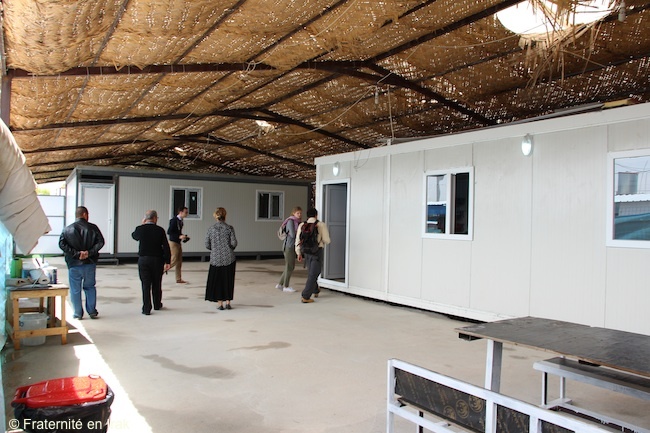 In Erbil, the capital of Iraqi Kurdistan, where Ashti camp welcomes 7,000 displaced Christians from the Nineveh plain, the Brotherhood with Iraq has started to build a handicraft center for women, right next to the children play area the association opened last year. At the start of this project, Sahar, a Christian woman from Mosul who fled the city when ISIS arrived in June 2014. Members of the association had met Sahar in Mosul in 2012, and it is with great joy that we met her again to support this great initiative. 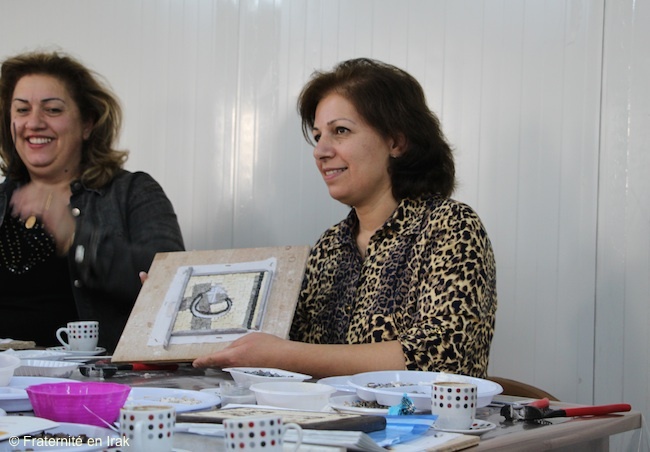 At the beginning of the year, she and three other women traveled to Jordan to receive technical training in mosaic art. Meanwhile, a 430 sq. 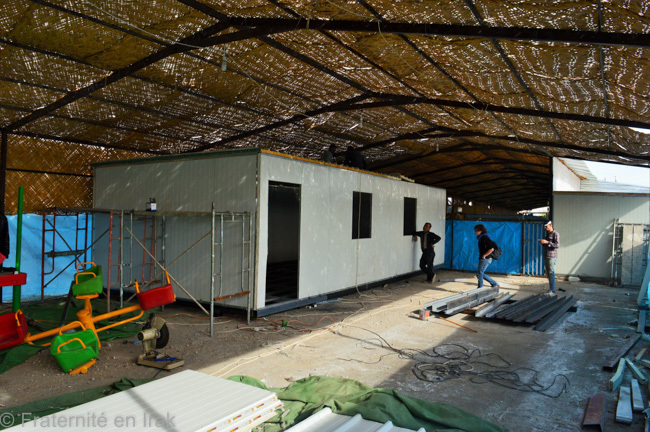 ft. trailer home was installed in Ashti camp, together with the equipment and furniture needed to open the workshop. 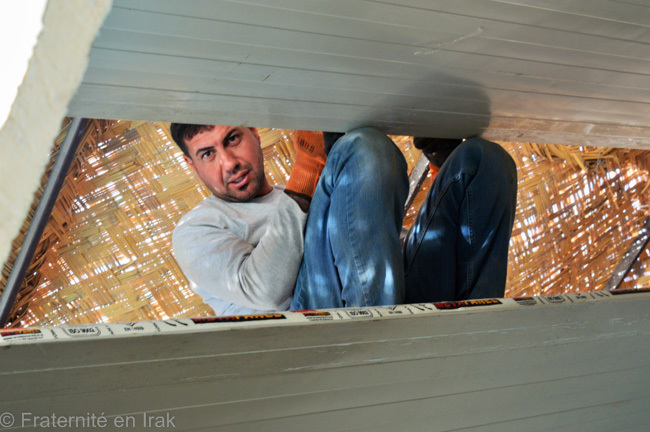 The work site was supervised by our Brotherhood with Iraq teams, who follow one another in Iraq every month. Twenty women from Ashti camp now take turn at the workshop, open every day from 10am to 6pm, around a core group of 5 women including Sahar, the manager. The art pieces, which display religious and profane themes, are made with sticks of natural stone from Jordan. 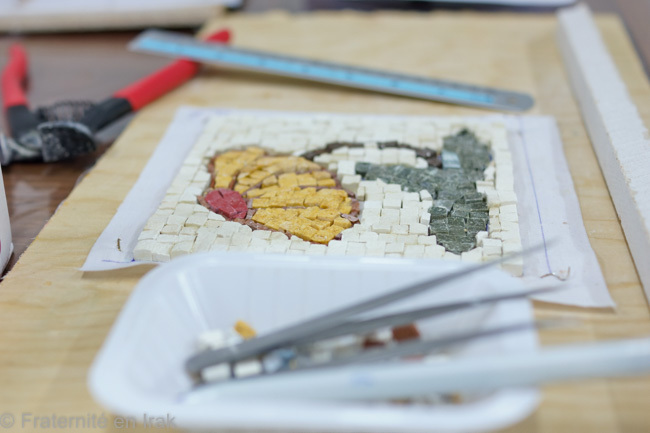 It takes an entire week to complete a mosaic piece: everything is handcrafted. Objective: an income for the women of the workshop. As of today, the women are all volunteers, but the objective is that they are soon able to earn a small income from their work. 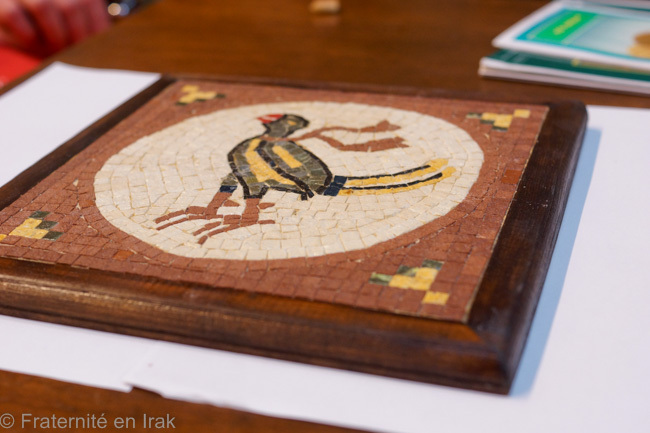 For that purpose, the mosaic pieces will be sold by the Saint Irenee Foundation (Fondation Saint Irenee) in the Lyon diocese, in France. For the French, it will be an opportunity to buy quality handicraft and to offer a unique and meaningful gift while supporting women in Ashti camp. Logistics are still being discussed. We will update you as soon as sales are available! The proceeds will also allow the workshop to grow, and Sahar has a lot of ideas! 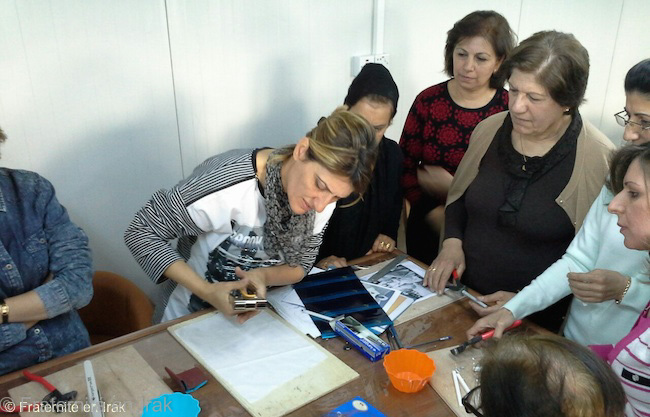 There are already two sewing machines in the workshop: for Sahar, it’s the next step. Sewing could help answer several needs in the camp, and she would like to hire women who face particularly challenging situations. Rayda, 52 years old, is from Mosul. She is married and has 4 children — two of them are married. She lives in Alsham One, another camp for displaced persons in Erbil. In Mosul, Rayda worked at the university, in the administration. Like all civil servants, she still earns an income, which allows her to provide for her family. She met Sahar in Mosul, where they had organized an exhibit together. 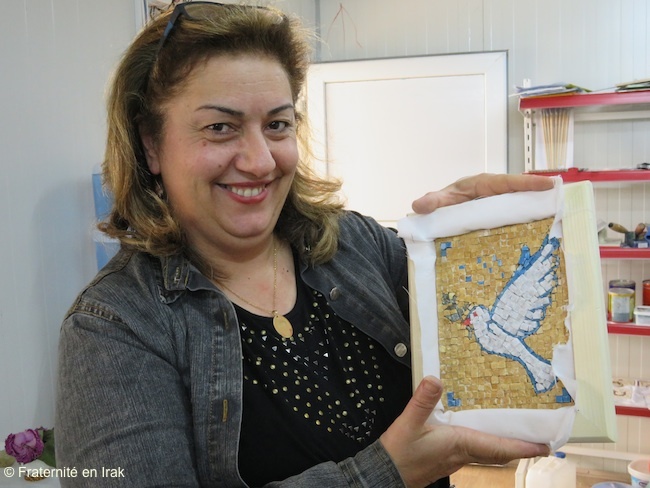 Rayda spent 10 days in Jordan to learn mosaic art. Juliette, 44 years old, is from Qaraqosh (a big Christian city in the Nineveh plain, conquered by ISIS in July 2014). She lives in Ashti camp with her parents, and she isn’t married. Before ISIS arrived, Juliette had a garment store. She met Sahar in Ankawa Mall, a camp for displaced persons that was located in an abandoned supermarket, now closed. They had both volunteered to receive, sort and distribute clothes there. It is the first time Juliette makes mosaic art, so she still finds herself too slow! But she enjoys it and comes every day to the workshop. She doesn’t have any income. Her brother works to support the entire family. Thank you to all loyal supporters who contributed to the opening of this handicraft center. Help us make it grow! Help the Brotherhood with Iraq, make a donation!